It must be a sin. It felt like one: there I was, perched gingerly on the store floor, scanning the shelves and boxes of just-arrived cook-loving books at the half price book store (Half price? My husband teases me: you are spending money to save money?). I am Dutch after all: I am a SUCKER for good deals. No doubt when the deal is good, my left hand hardly knows what my right is doing. Doesn't that ring of wrongdoing? It really, really was a good deal, after all. And now that I am in culinary school, all my efforts to resist buying food-related, cooking inspired, chef advised, food-glorious books has gone... to hell in a hand basket (couldn't resist). That really is a funny phrase, mind you, as I find hand baskets to be not only convenient but environmentally friendly. In fact, a hand basket would've been perfect to carry home my new, such-a-steal, chef recommended books. ... My sin? 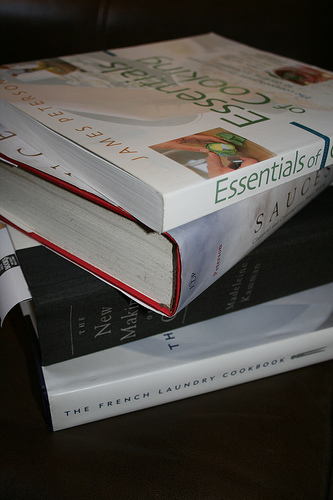 Phenomenal, highly regarded cookbooks from well-renowned sources---at bargain basement prices. I should feel guilty paying only $14 for The French Laundry cookbook, one that I have ogled at in fine, boutique bookstores for many, many years. At $50, it didn't even fit in the luxury budget... today I saved $34 when I bought it. Oh, and that is not all. I also bought: SAUCES by James Peterson (normally $50, I paid $9), Essentials of Cooking---also by Peterson, and The [New] Making of a Cook by Madeleine Kamman. This beast of a book has been recommended multiple times inside the few short weeks I have been at culinary school. I will let you know if I find it useful. What is your current foodie read/book/weakness?